On Friday, the Supreme Court of the United States declined to stay a lower court ruling that said the 2011 congressional map was the result of racial gerrymandering and thus unconstitutional. After the lower-court ruling and prior to the decision by SCOTUS, the GOP-led North Carolina legislature created a contingency plan, which Gov. Pat McCrory signed into law on Friday. The law, House Bill 2, eliminates second primaries for this election cycle and creates a June 7 primary for only U.S. House primary races under new district boundaries, according to an email from State Board of Elections spokesman Joshua Lawson to local board of elections offices. “The State will submit its redistricting plan to the three-judge panel for review. While we have heard from the U.S. Supreme Court, this matter is not settled, and we encourage all voters to vote the entire ballot and let the State Board worry about what to certify,” Lawson wrote. Following the passage of House Bill 2 and the new congressional map that state leaders hope will pass a review by the three-judge panel, NC GOP Senate Leader Phil Berger (R) acknowledge the recent chaos and encouraged voters to vote in every race. While Blue applauded the SCOTUS decision, he wasn’t happy with the contingency plan. “…Republican leaders approved a revised map Friday that focused instead on political gerrymandering, using political data as a proxy for race data. The approved map creates 10 Republican-heavy Congressional seats and three Democratic majority districts,” Blue said in a statement. As of right now, using House Bill 2 as a guiding point, local boards of elections offices are planning on a March 15 primary and then the June 7 congressional primary, which again only features U.S House of Representative races. “If we don’t hear anything out of the [three-judge panel review] we’ll continue to vote everything on March 15 ballot and [then the] June 7 congressional primary,” Watauga County Board of Elections Director Matt Snyder said, adding that it’s an “unlikely scenario” that the three-judge panel would have legislature change things again this close to the primary. “I don’t know when there will be some finality,” Snyder said. How Does All This Affect Ashe, Avery & Watauga? 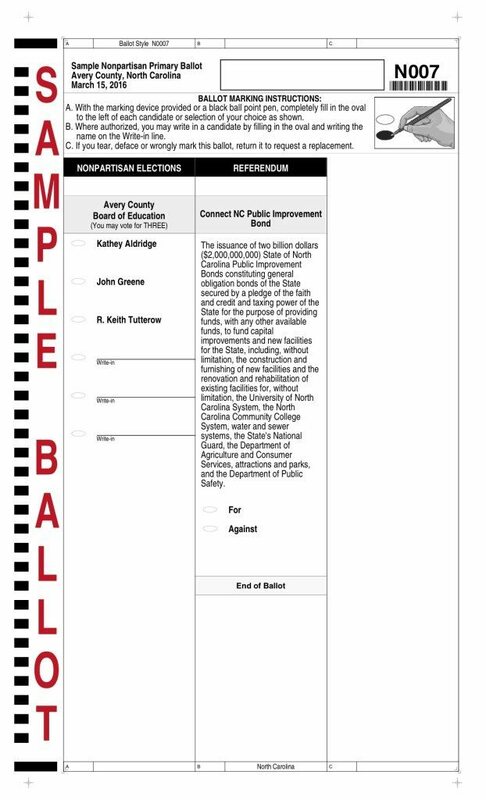 Sample ballots for North Carolina elections have already been created. This is one reason why GOP voters will see about 10 presidential candidates even though many will have dropped out by the time the primary arrives. If House Bill 2 remains, the change locally to the congressional map is that Avery County is now in the fifth congressional district, home to Watauga and Ashe – no longer in the more-conservative 11th district. Avery County Board of Elections Director Sheila Ollis acknowledged that primary voters might see different names on the ballot. In March, Avery County Republican ballot primary voters will see Tom Hill and Rick Bryson on their ballots for the 11th district race to see who represents the GOP in the general election. But in the congressional primary in June, Avery County will be voting for the 5th congressional district candidates – unless things change. But because candidates for US House don’t have to live in the district in which they filed, Avery Democratic ballot voters might still see Hill and Bryson on their ballots in June. When the June 7 congressional primaries occur, Republican ballot voters in Avery County will have a chance to vote for Virginia Foxx, Pattie Curran or any new GOP candidate that files for the fifth congressional district in the U.S House. Currently, there isn’t a Democratic primary for the Fifth Congressional District in the U.S. House or a Republican primary for the 11th Congressional District in the U.S. House. Challenger Josh Brannon will represent Democrats in the Fifth Congressional District race in the general election, while incumbent Mark Meadows is the GOP representative in the 11th house district in November. But that assumption, Shepherd said, is just another question that is still up in the air. Another interesting twist in this whole fiasco is that unaffiliated voters might have a say on both sides of the political aisle. In a normal election, unaffiliated voters must vote the same ballot (Republican, Democrat, Libertarian, Nonpartisan) in the primary and subsequently any second primaries conducted because of runoffs, which occur if no candidate earns 40 percent of the vote. Ollis said her office raised this question to the State Board of Elections. “They said, ‘Our way of thinking is that they could choose a ballot again,’” Ollis said.